One of the results of the increasing popularity of digital photography is the falling sales of traditional photographic materials. There has been a noticeable loss of shops specializing in equipment and materials for film photographers on top of many of the manufacturers stopping production of some of their products. One unexpected side affect, at least in London, has been that surviving shops have flourished. Hidden away behind the Old Vic Theatre in Waterloo is probably my favorite shop. Silverprint stocks pretty much anything a photographer could ever want. The walls are stacked with papers, books, materials and chemicals. The staff are friendly, knowledgeable and incredibly helpful. Notice boards are covered in scraps of paper and there is often a selection of framed prints on the walls. Whenever I go there I have to tear myself away once I have bought what I need. I always feel like I want to stay all day arguing about why I prefer T-Max to Tri-X. There are of course other shops in London and a few of them sell stuff cheaper. I admit that the last few times I have bought film it has been elsewhere, but it has been done with a sense of shame and betrayal. Whenever I can though, I try and return to silverprint, to touch base, recharge my batteries and my sense of belonging to a community that is hanging on for dear life in a fast changing world. I suppose it would be wrong of me not to acknowledge that silverprint also stocks and sells digital equipment and that I am guilty of shameless romanticizing when it comes to darkrooms and film. But perhaps shops like that bring it out of you. 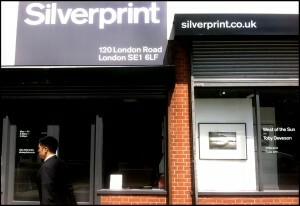 The only way of knowing for sure is to visit silverprint and find out for yourself.